Petrie Terrace, ca. 1902 - the building at centre right is our target. This week, after looking through the multitude of ghost-themed websites that now exist across Australia, I noticed that the vast majority sported long lists of "known" haunted sites throughout Brisbane...yet none provided even the slightest detail as to the history of the site, the supposed aspects of the haunting, or any indication of the resident ghost's origin. Obviously, to the amateur "Ghost Hunter" or history buff, nothing is more frustrating - Why is the place regarded as haunted? Has anything paranormal actually happened there? What happened to give the impression that the ghost belongs to "that" specific person? And most importantly, what is the history of the site, & do any historic aspects tie in to lend credence to the apparent haunting??? In this week's article, I hope to enlighten you all with a basic LOCAL HISTORY 101 lesson, through the examination of a known Brisbane haunting. For the amateur parapsychologist or Brisbane resident who suspects their house may be haunted, hours of wading through the regular ghost sites may likely leave you asking, "but why??" - the vast majority of ghost groups & organisations in Australia seem to lack the basic ability to research their target sites prior to running off blindly in pursuit of ghosts (N.B. A very small few are exceptionally good in their research & investigative techniques, however) - it seems that most groups' investigations are based on a single newspaper clipping, a short TV segment, a rumour from a brother's friend's aunty...in no way do these reflect extensive research. This week, without utilising my personal history library or usual Court/Police/Coroner's/Land's Office files, I'll walk you through an examination of the above haunting using nothing more than an internet connection & a laptop - any of you at home with these two resources, & a little time & effort, can carry out basic historic research to narrow down the possibility of a haunting at your target site, just like we will in this article. Ok...so first off, let's start with the known ghost story of Petrie Mansions in Brisbane - during the week, I sent a teaser out on our Facebook page in an attempt to discern who'd either heard of this haunting or was up to the challenge of locating information on it - Tylene, one of our fans, clearly won the challenge when she scoured the internet to locate what she could on the Petrie Mansions haunting, however a few of the details were missing - the whole story, as it is regularly told, goes thus: many years ago, a tragedy occurred at the site. A young girl named Hannah had been riding her tricycle on the upper veranda, & being curious as she was, decided to get a better look at the happenings in the busy street below. Pulling the tricycle over to the railing, Hannah stood up on the seat...before she could be stopped, the tricycle moved under her weight, tipping her off balance & toppling her over the railing to the landing some distance below...she died. Many years later, part of the building was converted into a restaurant & function centre - it wasn't long before Hannah made her presence known. Cutlery was frequently moved on set tables when the restaurant was shut, the security system was constantly tripped when the building was empty after hours, & a small silhouette was regularly seen moving behind frosted glass doors & curtains throughout the centre. We're going to heavily utilise the National Library of Australia's website for much of our research - primarily from the historic newspaper archive. 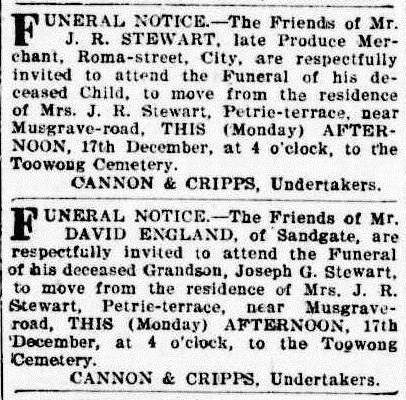 Knowing what we do about the supposed haunting, using the search string "fell" & "Petrie Terrace" & "died" from 1880 until 1954 across the The Brisbane Courier & The Courier Mail, over 700 articles are located - we will need to go through each of these to evaluate their content (time consuming I know, but 100% necessary). In doing so, we find that no article exists regarding a young girl toppling over a balcony & dying, so our story of Hannah is looking very shaky...however what we do find is very interesting, & possibly gives us an idea of how the story of Hannah evolved. 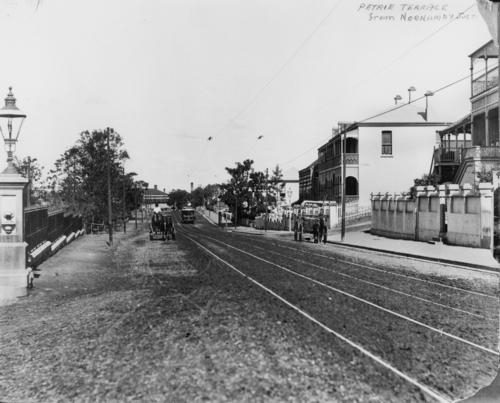 On the 17th of December 1900, on page 4 of the The Brisbane Courier, we find an article concerning a fatal accident on Petrie Terrace. According to the article, an infant boy, being nursed by his young sister on their balcony, accidentally toppled over the rail & fell to the stone landing below - after being rushed to the hospital, little could be done to save the boy & he subsequently passed away shortly after. A week later on the 25th of December, on page 4 of The Brisbane Courier, we find details of the Magisterial Inquiry into the young boy's death. 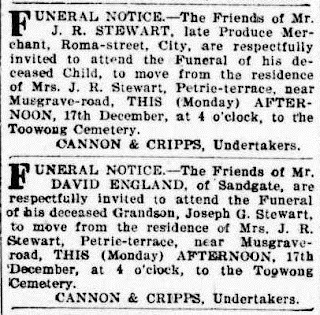 From this, we now know that little Joseph was buried at Toowong Cemetery on the 17th of December 1900, a detail we can confirm by running the details through the Brisbane City Council's Grave Location Search. Of greatest importance are the address details given for the mother's residence, on Petrie Terrace near Musgrave Road. As we know, Petrie Mansions is located very close to the corner of Petrie Terrace & Musgrave Road, just before the Normanby Five-ways...not only have we now located an actual historic event that closely matches the ghost story, but we've also confirmed that this event occurred in very close proximity to (or possibly at) Petrie Mansions. So, what more can we glean about the family from the information we've already located? In the article regarding the accident, it is noted that Joseph's father was in South Africa at the time of the incident. This is very interesting from an historical perspective, as contingents from all Australian States were sent to South Africa to serve in the Boer War, between 1899 & 1902 - however, on checking the nominal rolls for the Boer War on the Australian War Memorial website, there is no indication that Joseph's father served during this conflict. So, we return to the historic newspaper archive at the National Library of Australia to see what we can locate the father Joseph - keeping in mind that we also know from the funeral notice, that Joseph Snr was a Produce Merchant trading on Roma Street. Another search provides two articles in The Brisbane Courier, on the 21st of August & 6th of September 1900, showing that only months prior to young Joseph's death, his father had been declared insolvent & creditors had been called in to liquidate his assets. The articles also indicate that Joseph Snr is living at Enoggera at this stage. Using that piece of information, an additional search uncovers that a Joseph Robert Stewart, living in Enoggera, had served as a Councillor in the Ithaca Shire Council throughout the 1890's - are our two Joseph Robert Stewart's the same person?? They may very well be...something we need to add to our notes, which can be validated during a trip to the State Library & State Archives in Brisbane for further research. So...after carrying out some searches based solely on what is available on the internet, we've uncovered quite a bit of information that we can now utilise for higher-level research. We've virtually dispelled the local folklore of Hannah, but have located a remarkably similar event in time that likely gave rise to the legend...we've positioned this event in time to a location that closely corresponds with the Petrie Mansions...we've uncovered some back-history about the family in general, brought into question the father's movements when he was apparently in South Africa, & have raised further questions as to why the mother was living on Petrie Terrace with the children, when the father seemed to be living in Enoggera a few months previously before going bankrupt. All of these questions will find their respective answers at the State repositories on further research, but it's surprising how much we've already uncovered simply by sitting on the lounge at home with a laptop, right?? Knowing that, I cannot encourage amateur ghost hunters & curious ghost fans enough to constantly & consistently question, question, & question again...especially when it comes to Brisbane's ghostly history. Throughout this article, I have given you a number of links to online databases & archives that will help you to critically evaluate ghost stories that you've heard, or research potential hauntings you're curious about in Brisbane - most of these stories are based on no more than hearsay & oral legend, but memories are not infallible, even a month after the event...always endeavour to locate & verify the truth from multiple documentary sources, & question once again! There is absolutely no doubt that the Petrie Mansions has a resident ghost, however Hannah appears to be a myth & young Joseph at 20 months old seems too young to be at the core of the haunting - in a future article, we plan to get to the bottom of this one! if Liam Baker would of contacted QPI he would of been informed with the correct infomation, before making a statemant with no sound info , tipical writer wrinting up somthing to get reconised with out the real information . Thank you for the comment, yoyo. As a general rule, I tend to steer completely clear of information gleaned from highly questionable & unethical groups such as QPI when writing my articles - in much the same way you choose to steer completely clear of basic English language conventions such as spelling & grammar. As you seem to be familiar with the work of QPI, presumably in relation to the Petrie Mansions site, please feel free to use this forum as a means of disseminating the "real information" that I apparently overlooked - I'll be sure to pass it on to the relevant State Authorities such that they can modify the historic records accordingly! Anyway, they don't even exist anymore. Thanks for the laughs though. Great primer for the budding historian/investigator. I'm quite amazed at the amount of information freely available over the internet. Hope there are some more articles like this in the future. Wow! Just came across this article after telling a friend about my “ghost” experiences when I lived in the Petrie mansion back in 07’. Never thought to google it! Most definitely experienced a few unexplainable things that made me less of a skeptic living here. They mainly involved a little girl and old man. Crazy times!